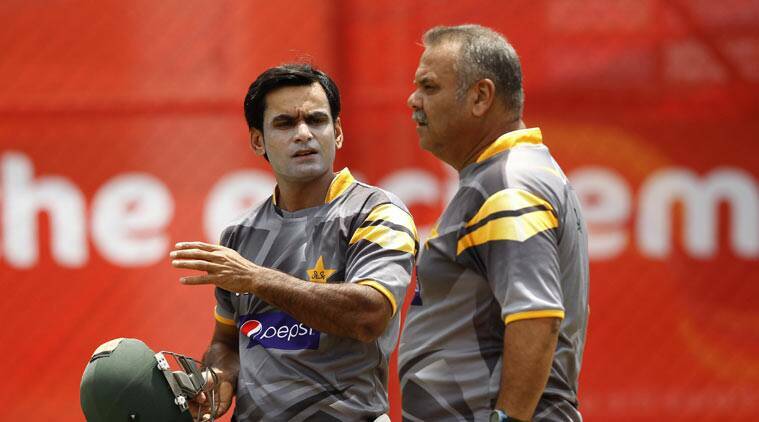 Mohammad Hafeez could still bowl at the Cup as he is still working on fixing his action with WC still a month away. Senior players Shoaib Malik and Kamran Akmal were ignored while fast bowler Sohail Khan made a comeback after nearly three years in wilderness in Pakistan’s 15-member squad for the ODI cricket World Cup in Australia and New Zealand starting February 14. The six member selection committee, after intense deliberations with captain Misbah-ul-Haq and head coach Waqar Younis in Karachi, decided not to repose confidence in stalwarts such as Malik and Akmal who have been in prime form this domestic season. Instead the selectors have put their confidence in a bunch of young players to spearhead Pakistan’s campaign in the World Cup. Among the 15, batsmen Sohaib Maqsood and Haris Sohail and bowlers Junaid Khan, Muhammad Irfan, Sohail Khan, Ehsan Adil and Yasir Shah have yet to play in Australia or New Zealand. “We have picked a balanced squad without any personal likes or dislikes and we considered all options without any grouses,” chief selector, Moin Khan told a news conference at the national stadium. He said the selectors had decided to lay faith in the youngsters keeping in mind the conditions, climate, opposition and travel schedule of the team in the World Cup. Sohail Khan, a right-arm fast bowler, has appeared in just two Tests and five One-day internationals and his last appearance for Pakistan was in Zimbabwe in 2011 but he has been in outstanding form this domestic season for Port Qasim Authority. “There was a close tie between Sohail and the experienced Muhammad Sami as the selectors felt the team required an out and out fast bowler for the conditions in Australia and New Zealand,” one selector said. Sohail took six wickets in a match of the ongoing Pentangular Cup on Tuesday in Karachi. Moin said the selectors had decided to go with a battery of pace bowlers while the spin department would be headed by experienced all-rounder Shahid Afridi. “We have picked leg spinner, Yasir Shah because he has lots of potential,” Moin said. Shah had just played a single ODI also in 2011 in Zimbabwe but was outstanding against Australia and New Zealandin the recent Test series in the UAE taking 27 wickets. It is after a long time that Pakistan will go into a major ODI event with two leg-spinners. “This is the best possible squad from the available resources, and the selectors believe it has the requisite talent and skill-set to recapture the World Cup Down Under after 22 years”, Moin said. Moin said Pakistan would miss the bowling of Saeed Ajmal and Muhammad Hafeez due to suspensions on them for suspect actions but the available resources were also adequate for the event. Shah ended with 27 wickets in the five Tests against Australia and New Zealand recently in the UAE. Moin said Hafeez could still be cleared to bowl in the World Cup as he is still working hard on correcting his action and there was one month left before the World Cup. “We have time as we play two ODIs in New Zealand before the World Cup,” he added. Hafeez has made the squad as a specialist opener in the final squad. “We have picked only two specialist openers while wicketkeeper, Sarfaraz Ahmed will be the reserve opener when required,” Moin added. Pakistan’s qualifying group includes India, West Indies, South Africa, Ireland, Zimbabwe and UAE. Pakistan World Cup squad: Muhammad Hafeez, Ahmed Shehzad, Younis Khan, Misbah-ul-Haq (Capt), Haris Sohail, Umar Akmal, Sohaib Maqsood, Sarfaraz Ahmed, Shahid Afridi, Junaid Khan, Muhammad Irfan, Sohail Khan, Wahab Riaz, Ehsan Adil and Yasir Shah.